Implementing the Medicare Annual Wellness Visit requires prioritization, team-based support, and processes aligned to value-based care in the health continuum tied to evaluations of health outcomes with personal prevention. The study results revealed HCPs who conducted AWVs were more likely to measure patient outcomes in the domains of depression, fall risk, sleep, and nutritional assessment (p <0.05). The authors examined the HCPs' work environment characteristics (the National Committee for Quality Assurance patient-centered medical home, frequency, completion of the visits, and health risk assessments/personal prevention plan) and found that HCPs were more likely to provide the AWV to patients when the AWV was included in the organization's performance scorecard (p <0.05). In the study, 52% of study participants reported conducting the AWV. Descriptive statistics of those who conduct the AWV found less than 50% of study participants were administering the health risk patient survey to their patients. Of those HCPs completing the health risk assessment, only 64% reviewed the treatment plan with patients, 55.5% developed the patient personal prevention plan, and 54% provided this written plan to the patient. The organizational strategy characteristics including measurement of patient outcomes, ease of screening, and development of clinical pathways were examined, and the results demonstrated that those who conducted AWVs were more likely to measure patient outcomes for cognitive assessment, depression, fall risk, sleep, and nutrition (p <0.05). 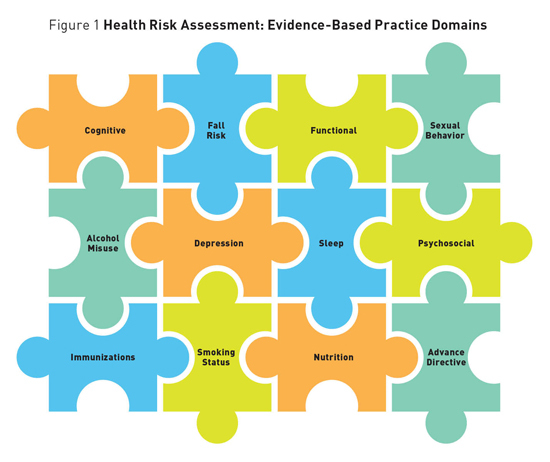 Additionally, they reported higher comfort levels in assessing the domains of cognitive screening, functional, fall risk, psychosocial, nutritional, and advance directives (p <0.05). Development of clinical pathways did not differ between the study groups. This study suggested that HCP-based opportunities are currently lacking, which may restrict access to the AWV for Medicare beneficiaries. Implementing the AWV requires prioritization, team-based support, and processes aligned to value-based care in the health continuum tied to evaluations of health outcomes related to personal prevention plans. • create a consumer awareness campaign. Solutions proposed to facilitate completion of the AWV include maximizing health care teams, specifically by utilizing members of the care team to the full scope of their state scope of practice laws. An effort to close the gaps in care and engage high-risk patients with intense care management when needed would be foundational to an approach. • considering alternative care sites, such as telehealth and home visits. The watchwords that characterize effective process alignment are administer, develop, implement, analyze, and modify (See Figure 2). • build a care pathway to impact patient outcomes and improve patient experience, with a focus on reducing overall cost of care. Bon Secours Health System, Inc (BSHSI), based in Marriottsville, Maryland, has prioritized the AWV as a driver of population health. BSHSI has embedded the AWV in its strategic quality plan and its short-term, board-approved goals, with the ultimate goal of not only a personal prevention plan but also a longitudinal care plan that follows patients across the continuum of care. The organization developed a multistate marketing campaign targeting patients to ask their providers to schedule an AWV. The campaign produced banners, posters, table tents, trifold brochures, and postcards. For the health team members, organizers developed a toolkit that includes talking points and scripts, optimized the electronic health record by building a smartset, added the AWV completion rate to dashboards and scorecard metrics, and included bonuses for executives who meet completion targets. In 2016, BSHSI's AWV rate was 55%. Best practices in adult immunizations when achieving a 40% AWV completion rate were associated with an 84.5% pneumonia vaccinate rate compared with a 53.6% pneumonia vaccinate rate in those without an AWV. Additionally, 30% more beneficiaries were screened for colon and breast cancer when comparing those who received vs those not receiving an AWV. While the causal relationship is unclear, there is a significant difference in quality measure performances between those beneficiaries who received an AWV vs those who did not. As health care delivery in the United States transitions over the next few years from volume-based care to value-based care delivery, preventive health care services will continue to evolve for health systems, HCPs, and Medicare beneficiaries. Now is the time for health system leaders to align organizational strategies to the value of the AWV within the scope of population health. For HCPs, this is an opportunity for the health care team to ground themselves to promote and deliver up-to-date measures for the use of clinical preventive services, incorporate evidence-based practice guidelines, close the care gaps, and build longitudinal plans of care for Medicare beneficiaries. Medicare beneficiaries deserve the opportunity to receive an AWV with emphasis on all 12 domains of care referenced in this article. An evidence-based practice, the value-based AWV offers Medicare beneficiaries the opportunity to prevent disease and disability and slow the progression of chronic disease. In this era of value-based care where measurement of outcomes, costs, and processes are critical, embracing an organizational AWV strategy is a crucial investment. — Lisa D. Wright, ANP-C, DNP, CPHQ, is an associate director at Merck and adjunct faculty at Jefferson College of Health Sciences at Carilion Clinic in Roanoake, Virginia. Her clinical interest includes prevention/wellness strategies and population health. — Kathie Zimbro, PhD, RN, is the nurse executive for research for Sentara Healthcare and an adjunct associate professor with the DNP Advance Practice Program at Old Dominion University in Norfolk, Virginia. — Carolyn Rutledge, FNP-C, PhD, is a professor and associate chair of the graduate program in nursing as well as the director of the Doctor of Nursing Practice Program at Old Dominion University and maintains a clinical practice at Eastern Virginia Medical School in Norfolk. — Liana Orsolini, PhD, RN, ANEF, FAAN, is the care delivery and advanced practice system consultant for the Center of Clinical Excellence and Innovation for Bon Secours Health System, Inc in Marriottsville, Maryland. — Cynthia Marcum, DNP, FNP-BC, RNC, is an assistant professor at Jefferson College of Health Sciences in Roanoke, Virginia. — Debra Hain, PhD, APRN, ANP-BC, GNP-BC, FAANP, is an associate professor and Blake Distinguished Professor at Florida Atlantic University, Christine E. Lynn College of Nursing in Boca Raton, Florida and a nurse practitioner at the Louis and Anne Green Memory and Wellness Center and Cleveland Clinic Florida. 1. More people with Medicare receiving free preventive care. Centers for Medicare & Medicaid Services website. https://www.cms.gov/Newsroom/MediaReleaseDatabase/Press-releases/2011-Press-releases-items/2011-06-20.html. Published June 20, 2011. Accessed September 19, 2016. 2. CDC focuses on need for older adults to receive clinical preventive services. Centers for Disease Control and Prevention website. http://www.cdc.gov/aging/pdf/cps-clinical-preventive-services.pdf. Accessed September 19, 2016. 3. More than 10 million people with Medicare have saved over $20 billion on prescription drugs since 2011. Centers for Medicare & Medicaid Services website. https://www.cms.gov/Newsroom/MediaReleaseDatabase/Press-releases/2016-Press-releases-items/2016-02-08.html. Published February 8, 2016. Accessed September 19, 2016. 4. Wright LD, Zimbro K, Rutledge C, Marcum C. Relationship between health care practitioner characteristics and comfort level with the CMS Medicare annual wellness visit [unpublished manuscript, Doctor of Nursing Practice]. Norfolk, VA: Old Dominion University; 2015. 5. US Preventive Services Task Force. The Guide to Clinical Preventive Services: 2014. US Department of Health & Human Services, Agency for Healthcare Research and Quality website. http://www.ahrq.gov/professionals/clinicians-providers/guidelines-recommendations/guide/index.html. Published June 2014. Accessed September 19, 2016. 6. 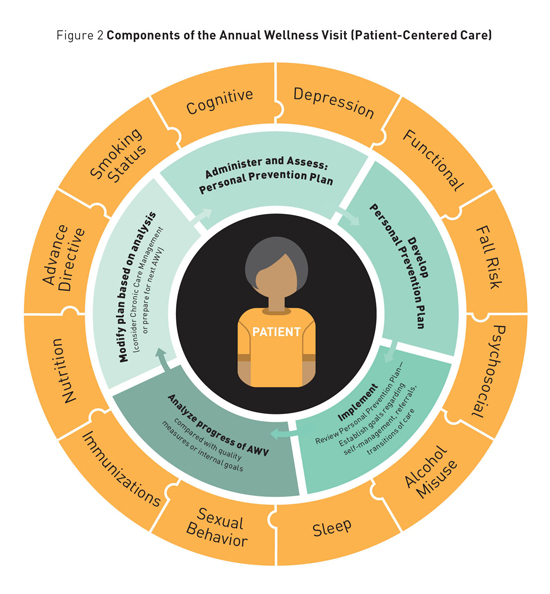 Advance care planning (ACP) as an optional element of an annual wellness visit (AWV). Centers for Medicare & Medicaid Services website. 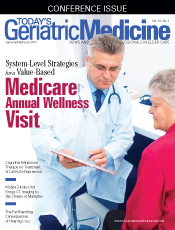 https://www.cms.gov/Outreach-and-Education/Medicare-Learning-Network-MLN/MLNMattersArticles/Downloads/MM9271.pdf. Published December 22, 2015. Accessed September 19, 2016. 7. CMS quality measure development plan: supporting the transition to the merit-based incentive payment system (MIPS) and alternative payment models (APMs). Centers for Medicare & Medicaid Services website. https://www.cms.gov/Medicare/Quality-Initiatives-Patient-Assessment-Instruments/Value-Based-Programs/MACRA-MIPS-and-APMs/Final-MDP.pdf. Published May 2, 2016. Accessed September 19, 2016. 8. Older adults. HealthyPeople.gov website. http://www.healthypeople.gov/2020/topics-objectives/topic/older-adults. Accessed September 19, 2016. 9. Chung S, Lesser LI, Lauderdale DS, Johns NE, Palaniappan LP, Luft HS. Medicare annual preventive care visits: use increased among fee-for-service patients, but many do not participate. Health Aff (Millwood). 2015;34(1):11-20.